Cait Whitson is a leading faux finisher in the UK. She has carried out work throughout the UK and Europe. She established her current business Carte Blanche in 1996 and shortly afterwards went into partnership with her husband Gibson Donaldson, and they live and work in their native Scotland travelling extensively in connection with work. Since Carte Blanche was formed, Cait and Gibson’s company has been sought out for their traditional standards and skills by titled people, families of note and owners of historic houses. Carte Blanche is a small but ever changing firm setting theirs sights at the highest level; recently awarded the British standard of excellence “Investors in People” they are set to grow again in size and stature in the knowledge that they are recognizably good at what they do. 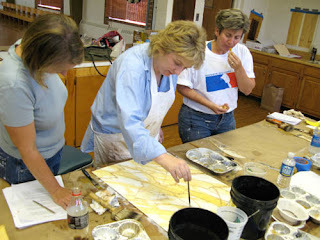 Cait has been involved in the decorative arts since 1986; her favoured field is graining and marbling. She learned her trade in London at Leonard Pardon’s School for Specialist Decoration. Leonard Pardon has since moved to the USA to teach. She subsequently trained at the late Bill Holgate’s school. She has been lucky to not only have this education behind her, but also the support and influence of mentors from the traditional painting and decorating field. Cait tries to visit the USA once a year to teach. This year she will be visiting 2 studios in the USA during June and July: The Chicago Institute of Fine Finishes and The Southern Institute of Faux Finishing. Cait is a working professional who teaches; not a full time teacher and this makes her teaching practical, commercial and realistic. She teaches small groups in such a way that will enable students to grow in their ability even after they have left her class. Cait and her crew are currently working in one of the largest banking halls in the UK restoring panels to look like limestone. The contractors have been taking great pleasure in trying to get the bank staff to guess which panels are real and which are not. Prior to her US trip she will be working on classical fluted columns in a Georgian House in Edinburgh painting them to look like Carrara marble; mimicking nature is what Cait does and does it so well.